The following essay by Bob Nickas was originally published in Lisa Beck’s new monograph, The Middle of Everywhere / The exhibition “The Four Corners of Abstract Painting (From sincerity to sarcasm, from formalism to expression)” may not be the first time that I encountered the work of Lisa Beck, but it’s the first show that I clearly recall. This was in 1987 at White Columns in New York, organized by its then ­director, Bill Arning. While Clearly sounds like the wrong way to amplify recall, we should let it stand. After all, this was more than 25 years ago, also known as a quarter century. What can be stated with certainty is that I saw the show, that her work was included and made an impression, and we came to know one another from then onward. Reflecting on that sort of fortuitous convergence now, one factor resonates. As we get close to an artist, we have the added advantage of discovering all sorts of things about them through their art, how they think about what they do, about the world, our place in it. The art may tell you more about the person who made it, and faster, than he or she is otherwise willing. At least that’s how it seems to me, lucky to have met many artists over the years, who each in their own way were foundational or helped to pull the rug out from under—true on both counts for Lisa Beck. Just how many isn’t so easy to calculate. Let’s say that if each artist represents a year, this amounts to two or three centuries at least. But who else was in that White Columns show? Not only can’t I name any of the other participants, I hadn’t even remembered its title correctly. In my mind it was “The Four Corners of Abstraction,” which is how it’s listed on the artist’s resumé. Cheating slightly, though with the best intentions, I searched the title and discovered not only my mistake but a subtitle. Unfortunate though it may be—for abstraction’s coordinates are not so easily mapped—it’s typical of that period, and in this sense revealing. By 1987 there was a return to painting in New York, and elsewhere, that offered a bastardized, market­driven neo­expressionism (that wasn’t exactly new), a bratty neo­pop (that was), with good old fashioned abstract painting, as Ad Reinhardt might say, bringing up the rear. If this seems more like three corners than four, what may be termed a triangulation of art in that moment, it’s possible that our model accounts for a certain, shall we say, devaluation. Either that or sincerity and formalism are perhaps too close to be distinct enough from one another, leading us to conclude, what might they become entwined? Would that be conformity? If Lisa Beck’s work is about anything it’s about expansiveness, which can only ever conform to its own disregard for limits. While she is never insincere, not in a single stroke of the brush, sincerity doesn’t seem an integral part of her equation. She can be sharp­witted and incisively so, yet sarcasm is nowhere evident in the fantastic world she conjures. As for expression, isn’t every work expressive? Of its sensibility, or lack thereof? Even a black square, a Secret Painting that refuses to divulge its invisible contents, their character and dimension? And isn’t every work connected to formalism, if only by default, especially those that revel in its deformation? This is what’s to be found in the convulsive folds of Steven Parrino‘s mis­stretched monochromes. It’s almost always the case that artists tell you about other artists, and he in fact may have made the introduction to Beck. The spatial negativity that animates his work can be seen as inversely corresponding to the buoyant permeability of hers. He confronts us with what’s been forcibly excised, while she subtly suggests what else is there. Within the good trip/bad trip dialectic, STP versus LSD, acknowledging that even nightmares can be transcendent, an artist and writer important to them both, Robert Smithson, comes readily to mind. While Steven Parrino’s world embraces the Smithsonian entropic and Lisa Beck’s the reflective, they are suggestively and inextricably intertwined. Parrino and Beck, oddly enough, were only rarely invited to participate in the same exhibitions, though the first time her work was included in a group show, in the summer of 1983, was at the gallery Nature Morte in the East Village, where the “dark matter” of Parrino’s paintings most forcefully asserted its presence. 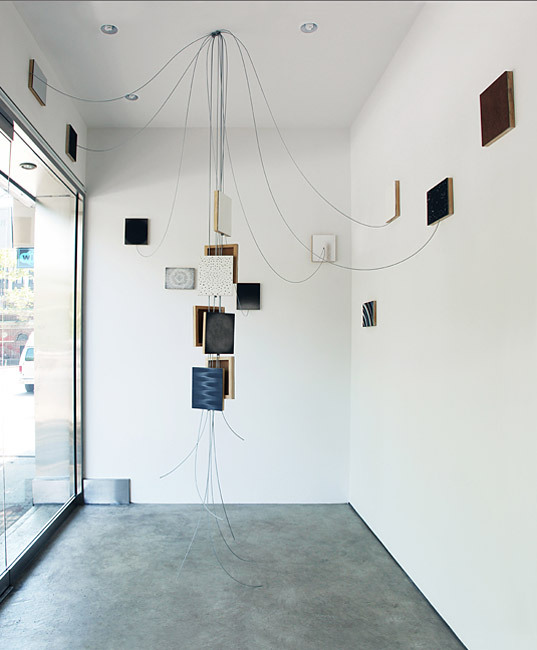 Lisa Beck, To Here Knows When, 1992 (2012 installation), mylar and oil paint on panels, glavaized wire rope, hardware, dimensins variable. Back then, the matter by which we are all made was subjected, on a chemical/molecular level, to various enhancements which had a profound effect on visual artists. In this respect, with art experienced as a drug itself, the late ’60s and the late ’80s, in America at least, overlap provocatively. Our ways of seeing were opened up under the influence of psychoactives, and art seemed to be everywhere because everything was suddenly so much more interesting to examine, and for greater lengths of time, though one’s perception of time could become elastic. Had four seconds passed? Or was it four minutes, four hours, four days? This new state of heightened awareness, for someone like Lisa Beck, had been there all along—in the vibration of wind on water and the convex inversion of a room viewed through a glass ball, in the swirl of a fingerprint and the hazy wavering of heat on the highway. She had, for example, studied and absorbed the endless wonder of Ernst Haeckel’s Art Forms in Nature (1904) alongside that of Chinese landscape painting. A whole realm of visuality was completely alive, most sensationally in the natural world, and had always been so. In the late 1960s, the sculptor John McCracken famously stated that it was only after hallucinogens that he truly understood space—and that life forms on other planets would instinctively grasp the meaning of his work. The notion of the psychedelic tends to be widely misunderstood in an art world that is all too often visually ­impaired. In this delimited view, swirling forms in fluorescent colors illuminated by a black light are thought of as psychedelic when the gleaming, silken threads of a spider web are infinitely more so. It’s easy to say that if you’ve never turned on, your view will only be one­dimensional, easy to privilege the view from up above. And yet there are any number of artists that we consider in relation to Beck’s sensibility who had been naturally “dosed,” born with a second sense of sight, among them Forrest Bess, Charles Burchfield, and Yayoi Kusama, artists who are now given the status of insiders/outsiders. This is a dialectic which also needs to be understood beyond the confines of art terminology, for perhaps the greatest insight afforded by expanded consciousness is the realization of how small we are in relation to the universe. The world goes on within us, and without us. This notion of expanded conscious as it transmits art under the influence was explored in two shows in which Beck’s work was exemplary, “Timewave Zero/The Politics of Ecstasy,” in Graz, 2001, and “Curious Crystals Of Unusual Purity,” in New York, 2004. 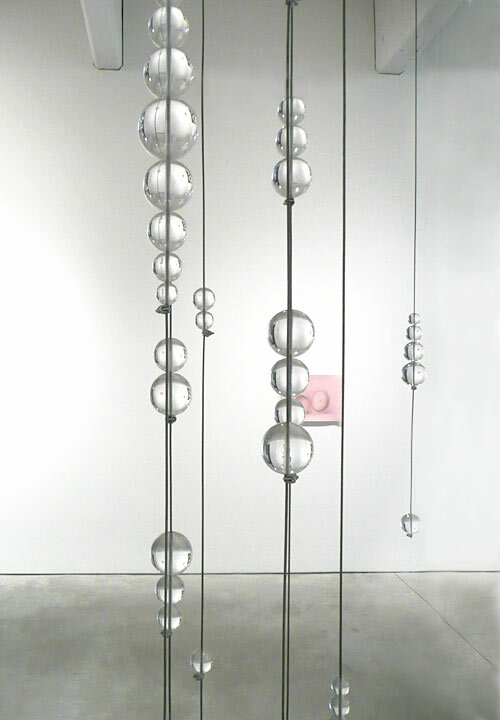 Each included hanging pieces, strands of glassy acrylic balls suspended on steel cables between ceiling and floor, or heaven and earth. Influx (2001), appeared to be a column of frozen raindrops, and Glimmerer (2004), relied on a single strand to orient/disorient a wall painting that fanned out of a corner as if a Rorschach butterfly had spread its kaleidoscopic wings. A more recent work, The Sun Is Down (2012), shown in Vienna and then in Lyon, relates more specifically to painting and to the idea of pieces, of parts to the whole. 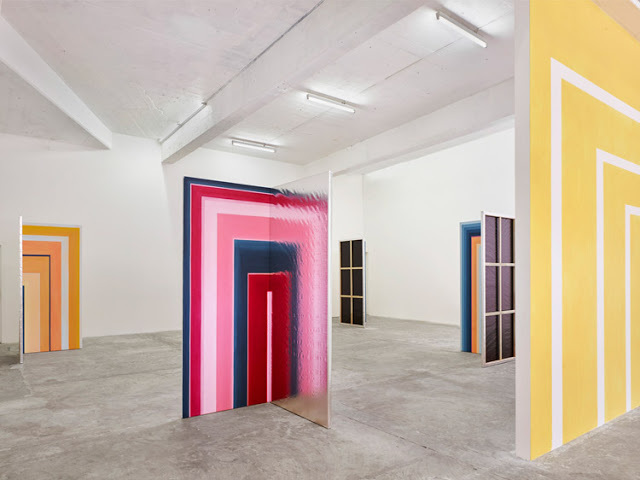 The same cable by which Beck has suspended an array of panels connects them to a number of paintings clustered on the wall, rendering it a kind of umbilical cord, and some of the hanging panels are covered in mirror­like mylar, reflecting the space in between. Beck’s visual language has been so consistent across the span of thirty years, and she elaborates on the elements and effects in such an organic way, that without the dates attached to these works we could be persuaded that they were all made in and around the same period. Time, then, can be thought to evaporate when space folds in on itself to proliferate. Or, as Smithson once remarked, “For many artists the universe is expanding; for some it is contracting.” As we look back on the work of Lisa Beck, we appreciate how it can only ever be both. If Beck’s art is concerned with endless permutations, it’s because she knows that nothing is finite, not even space, and space is anything but linear. This accounts for her endless fascination for all things round, radial and revolving, for circles, balls, marbles, globes, planets, spirals, waves, whirls, eddies and orbs. She knows that if you walk determinedly in a straight line from one end of the earth to the other you can only arrive where you began. One’s movement, imperceptibly tracing the curve of the earth and in parallel with its rotation, never really articulates positions that are visible to and distinct from one another. These are, in the Smithsonian sense, the “pointless vanishing points” that imbue the contours of absurdity with its political, topographic dimension. And Beck isn’t in any particular hurry to “get there.” As most of us know, the universe wasn’t built in a day. The image on the White Columns invitation card features a sort of stellar compass with points facing North, South, East and West. Looking at it now, I’m reminded of a plan that Lee Lozano made in 1969 for a four­-part painting that perceptually creates a large circle in its central negative space, the wall in between the panels activated to create this illusion. 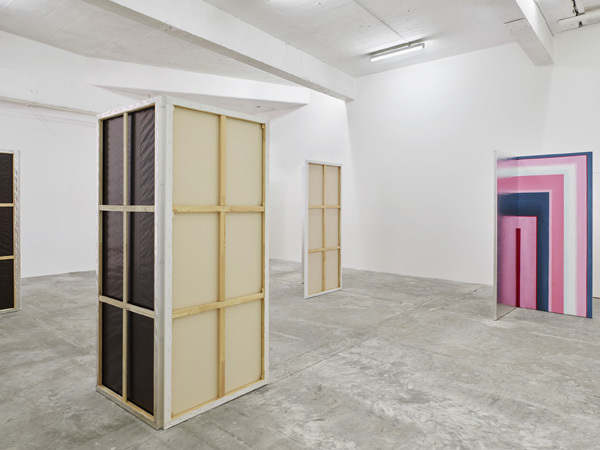 As abstract as the image may appear upon first sight, Lozano has shaded each panel in such a way that we come to see what she means for it to represent: the light and darkness cast upon the Earth as it turns towards and away from the sun. In addition to various measurements and notations on the page, she has prominently printed at the top a quotation from Buckminster Fuller, father of the geodesic dome: “As soon as I complete the drawing of a circle, I wish to be outside of it.” While the products of our mind are truly perceptible once they have taken form, the form itself requires distance to be coherent, proximity determined by scale. Our planet, for example, is only observable as an object in space once we are beyond its atmosphere—and even then it’s never visible in its entirety—while vast worlds can be encountered under the microscope. Beck’s acceptance of that most commonplace designation of artworks as “pieces” is her acknowledgement that there is wonder and truth in incompleteness, that to follow the clues is an ongoing pursuit, and that everything is somehow connected to everything else. 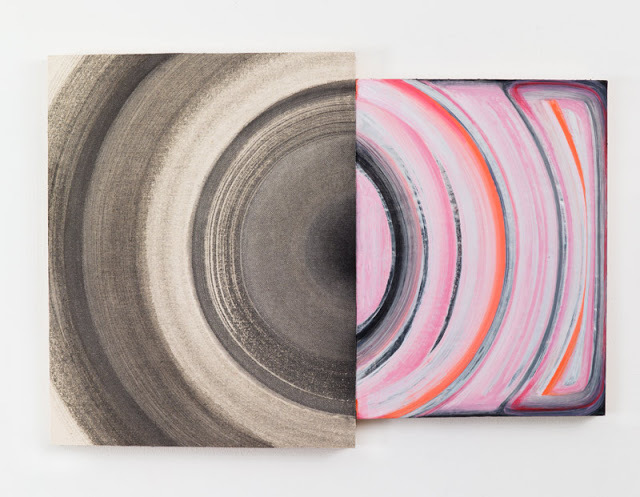 Lisa Beck, Gyre, 2015; acrylic paint on canvas on panel, panel, enamel paint on panel, 10 x 13 inches. Twenty years after Lozano, and unaware of her four­-part painting, Beck devised a dark-­hued twelve­part piece, The Shining Path (1989) that also relies on multiple elements and the negative space of the wall to suggest an after­image of sorts, a perforated cluster of Moons expanding ever outward. As it alternately appears to come forward and recede, we can imagine any number of shows emerging from out of those four corners of abstraction, advancing by powers of ten. Beck knows that reliably accurate answers are always outnumbered by reliably beguiling questions, and that these circle around one another, leading purposefully if mysteriously to others, not dissimilar to the way in which science is advanced. Scientists don’t want to figure everything out so that they can close up the lab and call it a day. And neither do certain artists, at least those around whom we tend to orbit, who envelop us in their gravitational pull. For the painter, predictions don’t have to come true, they only need to be made. The crystal ball doesn’t have to hold within it any spectacular revelations. It’s beautiful and fascinating in and of itself. And if art is about problem­-solving, not having a problem to solve would pose the most daunting, immobilizing problem of all. Beck is also well aware that as far as free will is concerned, you don’t have to decide whether or not to pay the price of admission. When we come into the world we are, all of us, already on the ride.